Rump roast. It's one of those cuts of meat that makes you scratch your head. I know how you feel, and I learned a very valuable lesson early on in cooking… When in doubt on how to cook meat, use a crock pot. They fix everything! That, and you top everything with bacon. In my opinion, a crockpot is the most versatile and valuable tool in the kitchen. 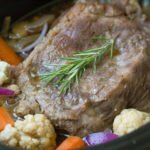 I believe in them so much, I spent 2 months making The Ultimate Guide to Crockpots! Cooking Hack #3,643 – When in doubt on how to cook meat, use a crockpot!! If you go to the store looking for a rump roast, you won't find it anymore!! Did you see that tweet above this? The beef and pork industry changed 350 names of cuts of meat to be more appealing and sell more. Just in case you run to the store to buy a rump roast, it will probably be labeled Leg Sirloin now. 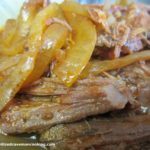 You can actually use any tough cut of beef interchangeably with this recipe and get great results. Every one always asks what my favorite crockpot is. I have used at least 5 different brands of slow cookers and crockpots and have finally landed on my favorite. I now own 4 of the same one and they never fail me. My favorite all around crockpot is the Hamilton Beach Set ‘n’ forget Slow Cooker (6 quart). I also have favorites of every size and there's even a Wifi model. What is your favorite recipe to make in a crockpot? Leave me a comment so I can try it. Generously rub this spice mixture all over your rump roast to your taste liking. If you don't like too many spices just lightly coat it. Interested in eating more healthy? I don’t know if this has been asked, but can you add in some chopped carrots or would they turn to mush? This is my go-to recipe for a crowd. I’m making it today for a football playoff party. It’s a crowd pleaser! I use chicken broth if I don’t have beef broth. The meat is perfectly tender every time. Easy and delicious – thank you! We are so happy you LOVE this! I actually just made this last week and I used carrots as the base.. it was, amazing! I have a silly question..do you leave the strings on when cooking roast in crock pot? No Silly questions :) Yes leave the string on and be sure to safely cut it after your roast has fully cooled to a safe temp. This was good. I coated it in sea salt the night before. Then followed instructions, adding potatoes instead of onion. I had it in the crockpot for 8.5 hours (on high for the few few hours, and then on low). Very good. Makes good juice/gravy. We love seeing these comments! Feel free to also let us know how it came out too! Fat side up or down in the Crock Pot? It is a preference, but personally I do fat side up because the juices flow throughout the cut and I find it comes out juicier! If i have a 2 1/2 lb rump roast. How long tk cook on low.?? This recipe is for a 3-4lb cut. So I would say about 8.5 hours on low would do the trick! I am preparing roast today for Easter Sunday. I hope all goes well. Thanks for your time and service. How did the Rump Roast come out for Easter? Hope you had a great day with family! 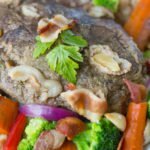 Is the roast defrosted already for this recipe? Or can it be frozen? Just put it in the Crock Pot hope it taste as good as it sounds.. 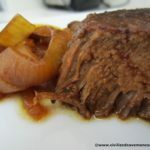 In other recipes that I saw for a rump roast they browned it before they put it in the crockpot. Why do they do that? Do you have to do that? Say, you’re into Cannibalism? 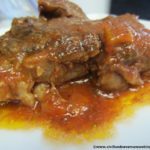 Would the meat be more tender in a slow cooker? Haaa, Haa! Thanks for your service Mr. Bryant. cook on high for 5 hours? have a 3# rump roast just waiting to be cooked. will try this recipe tomorrow and report back. By far the tastiest and most tender roast I have ever made! If you want a gravy simply add the leftover liquid to a small saucepan and add flour to thicken. What can I use if I don’t have beef broth chicken broth maybe? 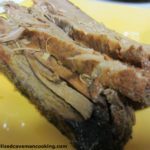 I use Campbell’s Golden Mushroom Soup when I make a brisket, pot roast and I even use it to top a meatloaf. I’m a homemade gravy person when it comes to drippings but with this or or potroast, it really doesn’t work to well. The soup has such a nice flavor and makes a great gravy! It may be worth a try! This really isn’t a recipe but perhaps a helpful note to others. I love fresh beets when they are available. For years I have struggled to get them cooked just right using my pressure cooker. The other day the light-bulb flashed a message–try the crock pot! Trim the stem end so that about two inches are left. Leave root just as it is. Do not peel. The night before put in crock pot (mine is a Slow Poke I received in the 70s! ), add about an inch or two of water, set on low, and the next morning amazingly you will have beautiful, tender beets, ready to peel, slice and season any way you like. Enjoy! what about adding veggies to the mix – I do this all the time with other cuts – wouldn’t it need more liquid? How do I make gravy from the juice left over? Make a roux. Melt butter, then add flour until the mixture binds. Heat, stirring continuously, until the mixture bubbles and changes texture. Slowly add the ‘juice’, until the gravy reaches the required consistency. If it is too thick, add a little water. This method can be used for any juices or stock resulting from slow-cooking or roasting. There is absolutely no need to use commercial stock cubes or ‘gravy granules’, all of which contain MSG and salt. You can make stock from ANY bones in the slow-cooker. Look it up. By the way, I am currently setting up my top rump to start cooking tomorrow morning, using the above recipe (with minor tweaks). I’ll check back on how it turns out …! There are a couple of ways to make gravy. First, pour the juice into a small sauce pan. Taste it. If it needs more salt, add a little at a time until it tastes right! Next, you can do one of two things. 1. Add about 3 tbsp. of butter to a second saucepan and melt it. Turn the heat to medium low and add 3 tbsp. of flour. Stir to mix. Continue flattening and stirring the mixture until golden brown and “nutty” smelling. Add your juice and turn up to boiling, whisking the whole time. It should thicken into a nice gravy. 2. The second way is my go to gravy way. Turn the heat to high and get your juice boiling. Turn the heat down to maintain a low boil or simmer. Take about a 1/2 of milk or hot water and add about 3 tbsp. of cornstarch to it. Mix well. Now, take the cornstarch mixture, and while stirring the juice mixture, pour a little at a time into the juice. As it continues to boil, it will become thicker. If it doesn’t, repeat the process. Note: It is important to stir and go slowly when adding the mixture to the juice, or it will get lumpy and you will have to strain it! Hope this helps! Happy cooking! Mix a small amount of corn starch with cold water, then add is to your slow boiling juice stirring constantly until thickness you desire. Corn starch always works. What size roast (pounds) is this recipe for? Thanks for asking this question eve! This roast had EXTREMLY to much pepper. 1 tablespoon of ground black pepper is to much for this amount. I made this tonight and it was delish. Next time I would add more onions and fresh garlic. You would add them with the onions to the bottom of the crock pot. I have not tested this but I’m sure it would be delicious. You may want to add a little extra broth to make sure they all cook well enough. Make sure meat is covered in broth..I add water too.. The reason I do not like digital crock pots is because if you set it and head off to work, and the power goes off for just a second, the crock pot will not turn back on. Living in Florida, if the sky burps, the power is likely to go out for a second. I have crock pots of varying sizes to accomplish just about any task, but I will not own a digital crock pot. Just hack a non digital crackpot using a light timer. Set it to turn on at whatever time you need and/or when you want it to turn off. Your problem is solved! Turned out fantastic.But way to much pepper for my liking! I’m assuming 10 hours of cooking time is for a -4-6 pound piece of meat. What if I use a smaller piece of meat? Maybe 2-3 lbs? How would you adjust the process? Sue, I think your little helper had a heavy hand. The recipe only calls for 1 tbsp. SueP, you didn’t accidentally add too much pepper. This recipe calls for 1 tbsp, which is WAY too much pepper and I like a lot of pepper. I have never seen a recipe call for that much pepper. That’s crazy. I would just season to taste and use your judgement. I used black peppercorns and crushed them myself, and I also thought the pepper was strong (and I love pepper). I’d cut the black pepper by 1/3 to 1/2. I also like the addition of a few tablespoons of apple cider vinegar, as it helped mellow out the pepper flavor. I also added a bunch of carrots and red potatoes. Great recipe, but not kid friendly at the full pepper strength! It may have been the paprika. Many cheaper paprikas have a strong bitter taste, and if you coated the top of the roast that didn’t ever see moisture, then when combined with the black pepper it will taste very strong. I would try leaving out the paprika, or substitute white pepper instead. If you use white pepper I would limit it to a half tablespoon though. Since I love garlic I make a few small slits in the top and insert some crushed garlic cloves. MMM…GOOD! I add 4 teas. of apple cider vinegar to some beef broth and mix it together and poor it over the rump roast and it helps it break down better and I usually crick mine 10 hours. Scrumptious. Melt in your mouth tender. I also add carrots, potatoes and chopped onion and salt and pepper. Perfect every time. I make this often, any cut of meat that’s on sale works great! Not on the Paleo diet, just loved George’s preface to the recipe. Had me cracking up! Had to try it! I use whatever broth I may have, even used beer once, it was fabulous! Enjoy everyone! This is a winner! What if I want this for dinner and don’t have 10 hours? Can I just cook it on high for shorter? 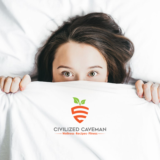 Question: I looked at Wild Oats and Swanson Organic beef broth today, both had cane sugar and one had soy…I know you aren’t suppose to have sugar on Paleo and I’m allergic to soy, do you know of a beef broth without? I just put your recipe in the crockpot but added water instead of beef broth, hope it turns out okay! I sure do, and this beef broth is currently free. Grab the free broth here. It will still turn out ok with water. Made this two days ago and boy is this recipe a keeper. The meat came out so tender and flavorful. Seriously the easiest dish to make and my whole family loved it. It’s actually in my crock pot again today. Can’t get enough. No salt? I don’t think I’ve ever made anything without any salt. But I’m new to slow cooker cooking. Thanks!! I was at the store on Jan 4 and found several Rump Roasts in the butcher case. No fancy renaming, despite your tweet. Looking forward to cooking the roast in the crock pot over night, and then adding a “pot roast” soup mix I found. Making this for the family for Christmas – I think I’ll take someone’s suggested advice to start it the night before as I have a 6 1/2 lb roast! Wish me luck! Made this tonight for my husband and seven year old foster daughter…..it was absolutely amazing! Seasoned a bit less to meet our taste and added a package on dry onion soup mix on top. It was one of the best tasting, flavorful rump roasts I have ever made. So much better than a recipe I tried that called for mushroom soup. Will use this recipe and again and again. I put 2 packs of au jous and one pack of ranch dressing powder, half a stick of butter, onion sliced, new potatoes, baby carrots, 1/2 box of chicken broth, 2 garlic cloves. 9 hours, fork tender. Awesome! Best beef rump roast I have made. Flavorful tender and easy. What are good veggie to pair with this? Going to try this recipe for dinner tomorrow. I love simple like some roasted broccoli or asparagus. Traditionally…chunks of garden fresh sweet carrots are served with pot roast BUT you can serve whatever is your fav! Going to try this recipe….but love the fact you answer each question! Never seen that before!! Thank you Peggy, I think it is important to stay connected and answer or help any way I can. I have always used chuck roast, but this time i got a rump roast (4lb). I have been slow cooking it for what i normally do (5 hours) but it is sooo tough i can’t believe it. Can someone give me suggestions as to why this happened? A rump roast is the but, right? and i thought it was a better piece of meat that the chuck…? I made this roast today in the slow cooker and wow is it good. I read all of it’s reviews and tweaked it accordingly. I’ve been making your bacon and garlic roast for a couple of months now and needed to switch up. I stuck with your beef recipes cuz they’re so tasty! Thanks so much for this one, it’s really really good. I’m a fan, I own your cookbook! Delicious…but way too spicy for us. Next time I’ll reduce the spices by 75%. For now, my husband has rinsed the meat under running water, leaving a moist, well-cooked roast that we will enjoy with a tiny bit of the sauce drizzled over it. A 3 lb. roast cooked on high was done in 5 hours. The meat was tender and pretty moist. I cooked it on high for 4 hours and low for 5 hours. It could have used a little less time but it was still tender and fairly moist. I loved the smell while it was cooking. That’s why i love slow cookers… they smell up the whole house! Not sure what I did wrong, but mine turned out really dry and tough. I’m sorry to hear that. What kind of meat did you use? How big was your roast? Lbs? Hello, it was 4 pounds! As always, this is delicious. The Mr. and I always have plenty of left-overs with this easy recipe. Just put it together added a bit of merlot ;) letting it cook over night. Sounds pretty tasty! We have made this several times. It is very good. I usually have to use chicken broth as it’s what I have on hand since it’s what is typically brewing. Tried this one. Pretty good. Maybe it’s my 6qt CrockPot but 10 hours on low was wayyyyyy too long. Meat ended up being a little dry. I even added a little more beef stock. Next time we’ll be doing it for 7 hours. IExcellent. Simple. I never cook and I’ve made this multiple times. Thanks!! Love this and ill be making it this weekend! This may be a really stupid question but…. The roast needs to be completely thawed right? Thanks! WOW thanks for this! Bought my first grass fed rump roast at Whole Foods today and was wondering how long I should cook it since it’s generally a tough cut. I luv “spicy” so this will go in the crock tonite before bedtime. Apologizing for a photo that has my mouth watering and rearranging my menu for tomorrow? Um, NOT NEEDED! Can’t wait to try this–I’ve never used a rub with this combination on a pot roast before. Can’t WAIT to try it! looks great! did you add any salt? also, is the garlic fresh, granulated, or powdered? thanks! BTW the photo’s not as bad as you think. Anyway if you want a quick fix, the “sharpen” tool in Photoshop (or Gimp, which is free) would give it more life. Made this today for the fam – I toned down the spice a little for myself and our 2 year old. Very tasty and the house smelled deliecious alllll day! Thank you for sharing this! I made mine a little bit spicier, as I spilled my whole bottle of paprika all over the kitchen floor…so, I subbed in more chili powder and a dash of cayenne.